Mayor-elect Bill de Blasio draws much of his populist identity from his Brooklyn neighborhood of Park Slope, a bastion of outer-borough liberalism where the tree-lined streets and charming brownstones are a far cry from Manhattan’s steel-and-glass canyons. Now de Blasio faces a crucial early decision in his transition, one fraught with political symbolism: Should he keep living in Park Slope when he takes office Jan. 1 or move to the mayor’s official residence — stately Gracie Mansion, on Manhattan’s Upper East Side? For now, de Blasio has delayed that choice, saying he will make the decision with his family over the next few weeks. But most of his neighbors in Park Slope, proud of his rise and skeptical that he could be happy anywhere else, believe that he should stay in the area he’s long called home. After all, de Blasio, who was elected this month as the first Democratic mayor in a generation, announced his candidacy in front of his modest row house. He coached his son’s Little League team in the nearby baseball fields of Prospect Park. He’s on a first-name basis with the staff of the nearby diners and pizzerias. And perhaps most important, his outer-borough roots fueled his run as a political outsider and connected with those who felt forgotten by what they believed was outgoing Mayor Michael Bloomberg’s Manhattan-centric view of the city. Moving to Manhattan doesn’t quite fit with that populist image, which may be why de Blasio in recent weeks has backtracked on statements he made during the campaign all but committing to living in Gracie Mansion, which has sat empty for 12 years as Bloomberg remained at his palatial townhouse. He cited the potentially long commute his 15-year-old son, Dante, would have from Gracie Mansion to his Brooklyn high school as a reason to stay. Park Slope is famed for its liberal ethos, streets dotted with low-lying buildings and tony boutiques. It has long been popular with families drawn to its schools, and its sidewalks are often crowded with strollers. De Blasio, who is white, and his wife, Chirlane McCray, who is black, settled in Park Slope largely because they felt that their interracial relationship would be accepted there, the mayor-elect has said. They live in a townhouse south of the toniest area of the neighborhood. The house de Blasio bought in 2000 for $450,000 is now worth $1 million. He also inherited a second row house nearby from his mother. As a councilman, de Blaiso was quick to react to his neighbors’ needs, but those in the Slope knew him as much as a neighbor as a politician. He regularly works out at the YMCA just few blocks from his house and helped coach Dante’s baseball team a few years ago. Even in the days after recording his mayoral victory, de Blasio could be spotted carrying his laundry or picking up dinner — often a pizza with olives — from a local eatery. “He stops in a lot, sometimes by himself, sometimes with family, and now sometimes with a security guard,” Michael Sachs, a clerk at a local eatery said, just an hour after the mayor-elect popped in for an espresso and a cookie. 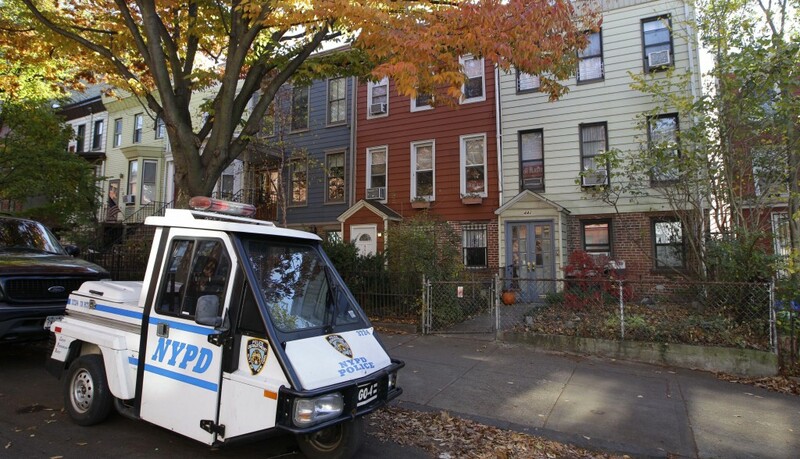 A single, three-wheeled NYPD vehicle parked outside de Blasio’s row house is the only sign that it’s home of the city’s next mayor. But that security will increase if he stays there after taking office, and the surge of official vehicles and additional traffic at all hours of the day does worry some who live in the neighborhood that already is notorious for limited parking. This article appeared in print on page 14 of the November 20th, 2013 edition of Hamodia.